Lauded at the Oscars and before that a critical and commercial smash, 12 Years A Slave has also been praised for its brutally honest portrayal of slavery in America. However, Irish movie-goers shocked by the realistic portrayal of slavery, and Michael Fassbender’s performance as the brutal plantation owner Epps, may be unaware of Ireland’s long and shameful involvement in the Atlantic slave trade. The story of the Irish sent as indentured labourers, little better than slaves, to the British Caribbean islands (most notably Barbados) has been well told. To hell or to Connaught, or the Caribbean, Virginia or Van Dieman's Land. But we have forgotten (perhaps wilfully) the involvement of Irish merchants, sailors, ship and plantation owners over a century or more in the trade of human beings. Entire clans of Irish slavers (from counties including Limerick, Cork, Waterford and Kilkenny) effectively ran the French slave trade for almost a century while Irish merchants, seamen and financiers were amongst the most enthusiastic slave traders of the eighteenth century. The many Haitians and West Indians who trace their ancestry back to African slaves transported on Irish-owned slave ships are living proof that the Irish have not always been the victims of history. Vast profits would establish Irish slaving dynasties, with the Irish of Nantes in France, closely affiliated clans of sailors and slavers, making the kind of money which allowed some to eventually join the French nobility. It was the final defeat at the Battle of the Boyne which sent thousands of Irish soldiers and their families to the continent and beyond. Some of those who went to France became the “Wine Geese”, establishing vineyards and brands that endure to this day, others bought into the slave trade. Typical of their stories is the history of one Irish merchant, originally from Kilkenny, who would go on to found one of the great Irish piracy and slaving dynasties. Philip Walsh was the son of James Walsh, of Ballynacooly in the Walsh Mountains in Co Kilkenny and at one time, a captain in the Royal French navy. He was present at the signing of the Treaty of Limerick on 3 October 1691, which marked the end of the Williamite War in Ireland between the Jacobites and the supporters of William of Orange. 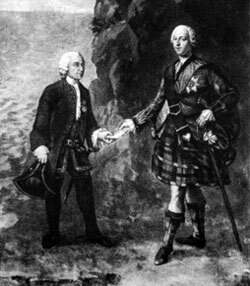 Philip Walsh together with his son, commanded the ship that carried the defeated King James II from Kinsale in Co Cork to France after the battle of the Boyne, they also ferried his son Bonnie Prince Charlie to Scotland for his ill-fated attempt to regain the throne. The Walsh's re-located to St Malo in Brittany (where Philip’s son Anthony or Antoine Walsh was born on 22 January 1703) and got into the licensed piracy business, sailing as “privateers” for the French crown and given free rein to attack, seize and destroy enemy shipping. However, it was Antoine who got the real family business – slaving – off the ground. By the early 1700s, the French port of Nantes, with a large, close-knit and hard-working Irish slave-trading community, became the chief slaving port for the kingdom of Louis XIV, the Sun King. It was said that half of the ships that sailed out of Nantes at the time were owned or stocked by Irish merchant families, including the Joyces, Walshes, MacCarthys, O’Sheils, Sarsfields and O’Riordans. Manufactured goods, guns, textiles, liquor and knives, were brought from Nantes to the Slave Coast, exchanged for slaves who were transported to the French colonies of Guadeloupe, Martinique and Saint-Domingue (modern Haiti) where they were sold for sugar and tobacco, which then returned to Europe. To their great credit, the merchants of Belfast, under the future United Irishman William Putnam McCabe, refused to take part in the inhuman slave trade. However, the merchant princes of Cork, Limerick and Waterford profited by financing and victualing the ships, feeding the slavers and slaves alike to great reward and family fortune. It is estimated that in the history of the Atlantic slave trade, the French turned four times as many Africans into slaves as the Americans. And the Irish were involved every step of the way. Antoine Walsh was, until he was comfortable enough to retire to his own sugar plantation on St Domingue (Haiti), a slave ship captain. The voyage, from France to East Africa and then across the Atlantic to the Carribean, was long and perilous and those making it faced everything from disease and foul weather to the possibility of piracy and mutinous human cargoes. By the early 1730s, Walsh had seen enough of the disease ridden coast of East Africa and the dangers of the middle passage and promoted himself from slave-ship captain to slave-merchant. Antoine had been lucky enough to avoid the bloody below-decks uprisings that claimed the lives of many slavers, including some of his employees and relatives. In 1734, the slave ship L’Aventurier, outfitted by Walsh’s father-in-law Luc O’Shiell (a former Jacobite officer) and crewed by Walshes, O'Sheills and other Irishmen narrowly survived a bloody below-decks revolt by its human cargo. Walsh died in 1763 on his planation, ten years earlier he had been enobled by King Louis XV of France. The Irish clans of Nantes, and others in Liverpool and Bristol, would continue to make vast fortunes from the slave trade. The Chateau De Serrant - The Castle Antoine Walsh bought as his family seat. All paid for by slaving. * If you like this - the full story (and others) can be found in my book - Murder, Mutiny & Mayhem – The Blackest Hearted Villians from Irish History – by Joe O'Shea – Published by The O'Brien Press. Thanks for this. Picked it up searching links to irish slavers here in Nantes where I live. O'Riordan's priceless Japanese black lacquer salon is on show in Ann of Brittany's Château museum here. Worth a viewing. I'm trying to find out more about him. The Dutch established their trading post earlier. It was thanks to them that the surrounding marshlands of the Loire estuary were drained, erected polders and transformed it into the notorious trading port. To give the local socialists their due they build a memorial to the hundreds of thousands of slaves who passed through on their way to the plantations.